The Christmas holiday is right around the corner. Use your bullet journal as a holiday planner and enjoy the holiday season. 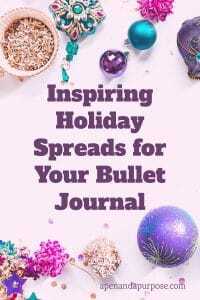 This post includes ideas for holiday bullet journal layouts. Holidays and planning go hand in hand. If you want to reduce holiday overwhelm, a holiday planner can help. Holiday bullet journal pages can help you create a plan. A bullet journal is a fantastic way to keep track of all of the things you want to accomplish for the holiday season. It is also a way to capture holiday memories and have fun while doing it. Maybe the most obvious and useful of all of the holiday bullet journal spreads you can make is the gift planning bullet journal page. On this page, you collect ideas for Christmas gifts to purchase for your friends and family. Starting this page as early as possible can help tremendously because it gives you time to think about and listen for what the people you are buying for would like. In fact, you could probably start this as early as the day after Christmas! Track what you’ve already purchased and what you still need to purchase. You can check off where you bought things, keep track of the costs and your budget, and keep track of where these gifts are. For example, if you purchased top selling gifts on Amazon, you could track whether they’ve been received or whether you are still waiting for them to arrive. Nothing is worse than noticing at the last minute that a gift for your cousin that you see once a year won’t arrive on time. This is why I use Amazon Prime! I can get everything in two days. I’m a huge procrastinator and having Amazon Prime during the holiday season is a lifesaver since most things arrive in two days. In addition to tracking purchases, a shopping or spending tracker can also be used to keep you on budget. Going off budget can increase holiday stress. What kinds of meals would you like to create for the holidays? Is there anything new you’d like to create? Your bullet journal is a great place to collect the different ideas you have for holiday meals and to make a plan for what you will make for the holidays. Are there cookies you’d like to try baking? What about cookies that are tried and true that you plan to make? These could all be listed in your meal plan spread. You can plan for sending out Christmas cards. I love the idea of collecting all of the addresses you need on this spread. Then you can refer back to it in the future to get the addresses of important people in your life. Does holiday media get you in the mood for the holidays? If so, you could collect these items to make a bullet journal spread. Holiday music can quickly put you in the mood for the season. You can create your own playlist in your bullet journal. The best part of looking at social media sites like Instagram is seeing all of the talent of other people who bullet journal. Do not let this intimidate you though because you can have a simple bullet journal and it is just as nice. In fact, instead of drawing, I use stickers and washi. I purchased these cute holiday stickers for my bullet journal and I can’t wait to use them. My favorite washi shop has some available right now as well. A great holiday spread idea is the 12 days of Christmas. You can count down to Christmas for as long as you’d like. A countdown is a fun thing to add to your Christmas bullet journal. Are there things you want to make sure you do over the holidays? Write them in your bullet journal and mark them completed as you do them! Every year people lug out boxes of decoration to put up around their house. These include ornaments, holiday lights (these look really neat), Christmas trees, and other decorations. Throughout the year you might forget what you have. A bullet journal spread of your inventory can help you plan for next year. It also may help you with your wish list spread! Keep track of all your have to dos and want to dos on a bullet journal page! Best of all, keep track of memories in your journal. Moments pass by so quickly and often we forget the good things that happened. Take some time as you go through your holiday to take out your journal and jot down things you did that brought you joy. Write down important gifts, reactions to gifts, nice things that were said, and fun things to remember. If you need some extra help on how to remember to pull out your journal, read this post. You can even use this to add pictures to your journal. This will help you keep the memories for years to come and you can bring back positive feelings just looking at it. These are just a few ideas you can add to your bullet journal over the holidays. You could also check out my giant list of bullet journal collection ideas for more inspiration. Do you have any ideas for what you might add to your bullet journal throughout the month? If so, I’d love to hear about them.